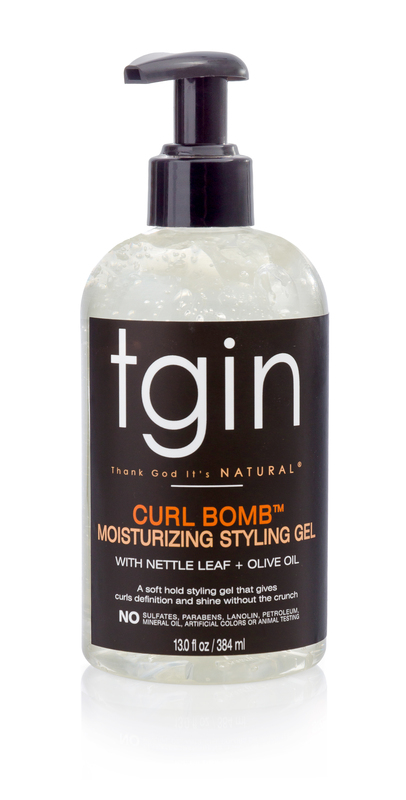 Create soft touchable curls without the crunch using tgin Curl Bomb Curl Definer Moisturizing Styling Gel. This unique formula aids in moisture retention, while providing long lasting curl definition. No parabens, sulfates, petrolatum, lanolin, artificial colors, or animal testing. Directions: Wash hair with tgin Moisture Rich Sulfate Free Shampoo to cleanse scalp and remove excess product buildup. Follow with tgin Triple Moisture Replenishing Conditioner. Rinse out. Apply a small amount of tgin Green Tea Super Moist Leave in Conditioner to wet hair followed by tgin Curl Bomb, and style as usual. INGREDIENTS: WATER, PVP/VA COPLOYMER, POLYSORBATE 20, MACA ROOT (LEPIDIUM MEYENII), BLACK COHOSH (CIMICIFUGA RACEMOSA), MILK THISTLE (SILYBUM MARIANUM), NETTLE LEAF (URTICA DIOICA), OLEA EUROPAEA (OLIVE) FRUIT OIL, GLYCERIN, CARBOMER, HYDROLYZED WHEAT PROTEIN, AMINOMETHYL PROPANOL, SODIUM HYDROXYMETHYLGLYCINATE, TETRASODIUM EDTA, FRAGRANCE (PARFUM). So you just gonna lay my edges then curl my hair huh? Without even asking my permission?! Girl just take all my money why don’t you. I tried the curl bomb and edge control and my edges laid, stayed fleeky and my curl pizooopppped. Like even the kitchen curls popped! How does that even happen? I don’t know and I don’t care! I’m just here to buy more! Let me start by saying I have 4D hair. I don’t even know if that’s a real number but my hair is kinkier than tons of 4c people I’ve seen. My curls don’t last workouts, work, swimming shoot walking to the corner store without turning into a shrunken up mess! I have never found a product that works as well for my curls as the curl bomb. My hair stays moisturized and my curl definition has outlasted things I can’t even mention on this board. If you have hair like mine and can never find something for you, try it! It will change your life. OMG!!!! Finally found my holy grail gel!!! I’m a researcher. I don’t waste my money on anything. I research, I ask friends, I read reviews, I watch videos. After reading the reviews on the curl bomb I decided to give it a try. I was so happy I did. My curls lasted for hours and smelled amazing.